f.9 View of Rauza from cave temple of Jagannath Sabha, Cave 33, Ellora. bl.uk > Online Gallery Home	> Online exhibitions	> Asia, Pacific and Africa Collections	> f.9 View of Rauza from cave temple of Jagannath Sabha, Cave 33, Ellora. Wash drawing of Rauza from the cave temple of Jagannath Sabha by an anonymous artist in 1849. 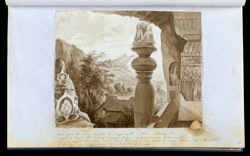 This is one of 83 drawings (78 folios) mainly of landscapes and antiquities in the northem Deccan, made during a tour chiefly to Ellora, Rauza, Daulatabad, Aurangabad and Ajanta between September and November 1849. A few sketches were made later, e.g. 1853.